I continue to be troubled by the caption on this card. I know it says "Cymric and Arabic," but it simply can't be. 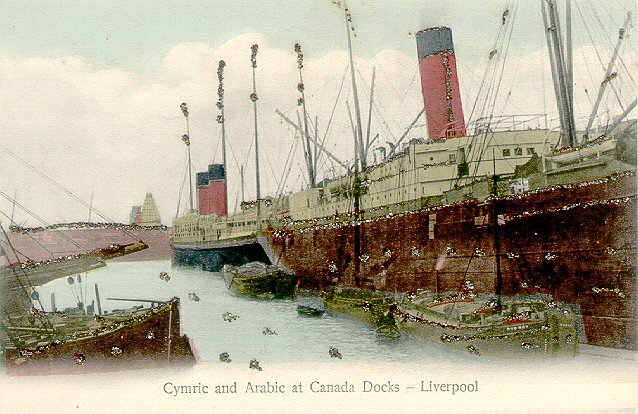 Cymric was a contemporary of Arabic II (the one torpedoed during WWI) and both of them were single stack ships. Cymric herself was torpedoed during the war, so she was at the bottom, not at Liverpool, by the time Arabic III came into the WS fleet. Furthermore, the single stack ship shown on the card can't be Cymric. Take a look at the other Cymric cards: There is a mast immediately behind the bridge. There is clearly no mast behind the bridge of the single-stacker shown on this card. And the placement of the lifeboats in front of the mast on this ship doesn't match Cymric's. For the same reasons, the single-stacker can't be Arabic II. Her mast and lifeboat placements were about the same as Cymric's. Finally, the two stacker isn't Arabic III, She had two masts; although it's a little difficult to tell, this ship appears to have three. I still don't know what these two ships are... I'm not even sure they're WS, since they don't much look like H&W design. I am quite certain, however, that neither is Cymric and neither is either of the Arabics.